Linda Moses’ arrangement based on Caroline Callahan’s original drawing. Last week, people all over the world were shocked by pictures of California’s super bloom, an array of purple, yellow, and orange flowers growing in tremendous numbers around California. In some areas, there were so many flowers that their bright hues were caught on satellite images from space. Over the weekend, Medfield’s Public Library was in a state of its own super bloom. For the Medfield Garden Club’s 21st annual Art’N Bloom, the art of Medfield high schoolers was displayed alongside floral arrangements created by members of the club, making for an enthralling and sense-invoking exhibit. Just as it has in the two decades prior, the exhibit brought an abundance of admirers. Students worked in a variety of media, including oil pastels, watercolor, graphite and colored pencils, acrylic paint, linoleum printing, digital photography, digital illustration, and digital graphic design. 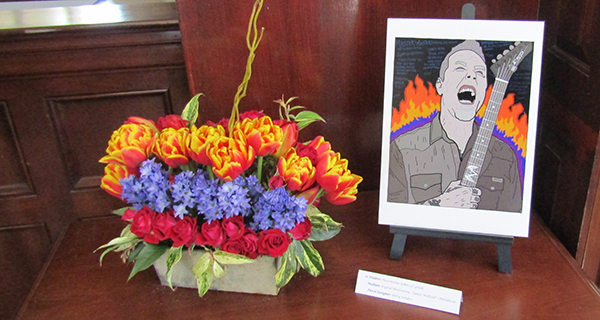 There were 19 pairs of floral arrangements and artworks in total, bringing an explosion of color to the library. Garden Club members did not have to strictly stick to the color scheme of the artwork that inspired them. For example, MHS senior Susie White’s detailed ink and water color painting of a colosseum used black ink, brown, orange, and blue. Paula King, who made the corresponding floral arrangement, used purple lilies, pink peonies, yellow marigolds, and some hot pink flowers, with some black vine accents. Maximilian Gobin’s original digital illustration and Betty Sander’s interpretation of it. MHS freshman Maximilian Gobin created a portrait of James Hetfield of Metallica jamming on a guitar using digital illustration. Floral designer Betty Sanders set her arrangement in a flower box, and created matching layers of flowers to the layers of color Gobin used in his portrait. Red roses stood in place of the purple layer used in the portrait. Blue bell flowers served as the blue layer. Red and yellow tulips represented the yellow and orange layer of flames in the portrait. Finally, a large decorative stem rising from the arrangement served as the guitar in the picture. Sophomore Caroline Callahan and Linda Moses made for an interesting combo. Callahan drew a still-life of a cooking area: a large metal pot, with a yellow banana, a red tomato, and a green Brussells sprout. The entire drawing was black, white, and gray, with the exception of the fruits and vegetables. Moses made a fascinating interpretation of this in her floral arrangement. She actually placed her flowers into a silver pot, with the pot lid leaning beside it. A majority of the arrangement contained white flowers, with pops of color thrown in. Yellow roses to represent the banana, red flowers to represent the tomato, and a couple of green dianthus to represent the Brussells sprout. It will be a few more weeks before Medfield sees the pop of spring flowers outside, and it’s unlikely it will be to the same degree of California’s super bloom. Inside the library last weekend, however, spring had already sprung with a super bloom of great artwork and fantastic floral arrangements.